Before audiences can marvel at the final product of a big musical, it takes the creative team months of preparation before they even move into the theater. What we see is only the tip of the iceberg, a piece of the pie. For every musical that I choreograph for Atlantis, my first step is always to thoroughly study the music and the script. Armed with initial ideas in my head, I wait for my Director’s lead so that he can align it with his vision of how he would want to tell the story. Waitress in particular is a props-heavy show. The pots, mixing bowls, baking pans, trays, sugar, butter, flour– they were all essential elements of the choreography. It was quite a challenge integrating all of these into simple dance movements. And needless to say, learning the fundamentals of baking was part of the whole deal. 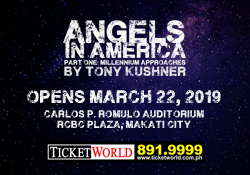 One thing that people don’t know is that when Atlantis brings Broadway shows to Manila, we need to make it our own. We cannot copy what was done on Broadway. For Waitress, I have to make my own hair and makeup design to suit our actors. I can’t put the actors in a super blonde wig because they are not Caucasian, so I have to work on the skin tone of the actor, what role he or she is playing, and if the wigs look real when they wear it. The reason why the female ensemble would wear wigs for stage is so that they can play different characters and change within seconds. In regards to makeup for Waitress, it’s fairly easy. It’s basic stage makeup. The the male actors also wear makeup so they don’t get washed out by the stage lights. We get our wig supply abroad, and usually we have a makeup sponsor to execute the makeup design to the actors. In any production, the Vocal Director is tasked with teaching the cast all the notes they need to sing for the show, including the styling and to some point the technique in creating the sound required of the show. 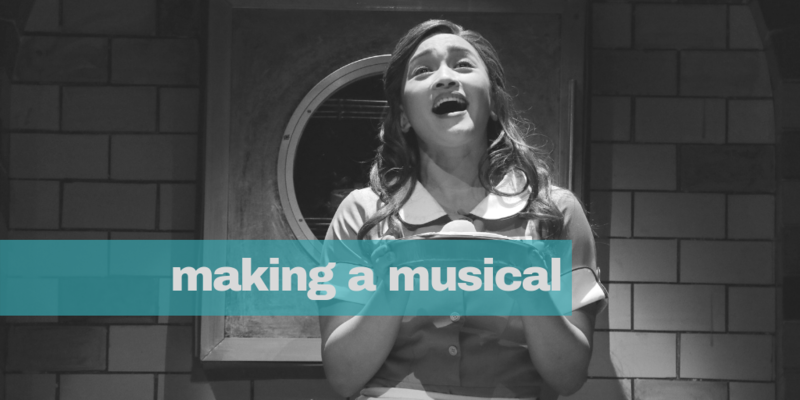 For Waitress, apart from what notes to sing, the challenge was more of how to make everyone sing the ‘Sara Bareilles’ style. The songs are quite wordy and full of narratives and most of her fans would know there’s a particular singing style. I work hand in hand with the Musical Director because during the entire run, the baton is his to keep the musicians and the actors/singers sounding and working together. The Sound Designer in turn is the technical savvy one who knows how to mix the sound in the theatre given all the voices and instruments, and how they should sound together. It all begins with research. We may think that clothes for this kind of show might appear simple and easy. They’re not. Most of the time, contemporary clothing styles are harder to compose as you have to be keen on trends and styles that flatter different body types and also what’s available in the market. A lot of my time was spent looking at images that show real life waiters and waitresses who work at diners and noticing how their uniforms vary in color, fit, and style. For diner customers, I actually spent time going to diners in Connecticut to observe how customers are dressed. I spent a good amount of time people-watching and this gave me more ideas on how to make each ensemble member for the show look unique and to highlight their individual style. Color choice for the waitress uniforms also underwent multiple phases until we became more solid with the set colors and tying up both worlds to create a tight and cohesive color palette. We went through a careful study of silhouettes, fabric choices, and also the technicalities of a couple of pregnancy bellies that are a part of Jenna’s costume elements making them look real as much as possible. The same prosthetics company who supplied for Side Show provided us these pregnancy bellies. Costume fittings play a huge part in all this. These are the times we get to see the actors in their outfits and see what works and what can be made better to achieve their characters. Also, as a costume designer based in the US, I have to make sure I’m present during costume fittings and meetings via video calls. My costume team in Manila is the one who does all the fabric sourcing and shopping. They send me pictures of all the options that they can possibly find and I either approve or disapprove them. My first conversation usually always begins with the director. We talk about the story and how we can make this specific production unique. I try to keep these conversations very abstract. Directors shouldn’t have to think about the specifics. We talk a lot about the emotion of the characters. We talk about time of day, or even what globally might be happening during this event. All of these things play into lighting. After talking to the director and the other designers, I start to plan how I can illuminate the journey. Months before we step foot into the theatre, we create a plot that basically tells the crew in the theatre where every light should hang, what color it will be. About a week before the start of the show, we install all the lighting. I watch rehearsals and map out where actors/actresses are entering and exiting. I see what emotional beats the company have explored through their process. Lighting is part of the glue that holds everything together. It’s also like the camera in films. The lighting designer should tell the audience exactly where to look onstage. Finally, we are all in the theatre. My team turns on and off lights to sculpt the performers onstage. We maintain visibility, yet shift color and intensity of light to support the emotions of the characters in the story. That’s actually the hardest and most fun part of the entire process. As we get through the process I try never to say no to the director, but always track the limitations of the project. I talk them through some specific hardships, just so they can keep the show in a realistic world. As the cast gets onstage, I might say “hey, can we move this scene downstage? It would really make it easier to light.” Ultimately, I am there to support their vision, so I am always open to their ideas. We then run the show to make sure everything is cohesive and make sure the audiences experience something rewarding. Designing the sound for Waitress is a tricky combination of bringing the intimacy of the orchestrations forward, so that all elements of the 7-piece band are present and impactful, while also trying to tie, or anchor that sound to the stage, so that it feels like a part of the world of the show. It’s a delicate balance, but very worthwhile when it pays off in some of the beautiful moments that exist in the show. Since many of the sound system choices have already been made regarding loudspeakers, loudpeaker placement, console, etc, my work really begins when we get into the theatre. In a musical that has a large amount of sound effects, my work would really begin in the rehearsal room, as we craft sound effects around all the moments in the show. For Waitress, my work really begins once we get into the theatre, as that is when I can begin to shape and craft the sound of the show based on everyone’s voices, and the orchestrations. In a musical, sound and music are one department. We work together to shape the sonic experience of the show. Some moments in a show require help from sound, and some moments require attention from the Music Director. In most situations, however, it is a healthy combination of both of us working together to achieve a common goal. In my mind, we are intertwined, serving the same function, but with access to two different tool boxes. A musical can only sound its best when sound and music work in tandem. 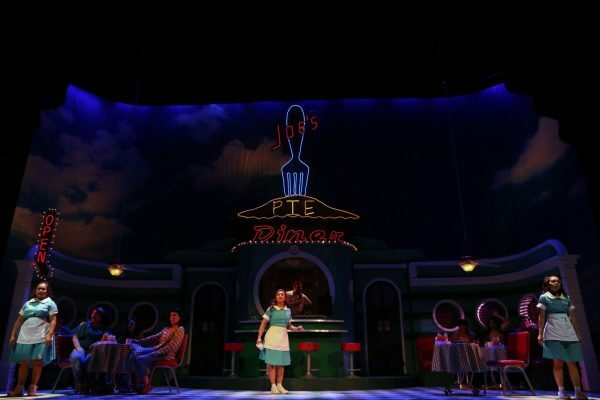 Most of the show takes place in a diner, so we started by looking at lots of different pictures of diners and thinking about how we could make our diner special, to establish a very particular style and tone for this audience. Bobby [Garcia, the director] showed me images of the television show Pushing Daisies. We both loved the wonderful artificiality, charming color palette, and quaint wit of the show’s production design. We agreed we wanted to combine the research we’d done, especially on classic diners from the American south, with the look and feel of Pushing Daisies. Once we knew what we wanted the show to look like, I picked up my pencil and moved to the drafting table to lay out the ground plan for the set. The ground plan is a scale representation of the theater, on which I place all the necessary elements of the show and figure out how they will relate to each other, and how they will move together, both onstage and backstage. As I’m laying out the ground plan, I also conceptualize the set in three dimensions. I start figuring out the architectural elements, as well as the colors and materials. Once all the ideas are ready, I put together a package of materials to represent them to the shops, so they can start building the scenery and sourcing the props. During the design process, I work collaboratively with Bobby, to make sure the set supports his concepts for the show, and with the lighting designer, Aaron Porter, so we can make sure we’re creating a unified vision. I also was helped tremendously by my local associate, Lawyn Cruz, who pulled the set and props together during rehearsals and tech. The ultimate goal here is to marry (musically) two major elements: the cast and the band. Both start out with the basics— learning the music from the score, note by note, phrase by phrase until it becomes a whole song, then a whole scene, then a whole act etc. For the band/orchestra, the process also involves understanding the context of every musical phrase in the song. A melodic motif may be about a character or a subject, it can recur several times, but each occurrence is never the same. It is important that every musical utterance is always in the service of the words or the story. For Waitress, we are trying to create a “sound world” that reflects all the myriad flavors and fragrance of Jenna’s pies. The “Sugar, Butter, Flour, and Mother” vocal loop is a recurring motif of the constant things in Jenna’s life. Sara Bareilles, given her gifts of melodic invention, also uses live rhythmic clapping, blowing, heavy breathing, etc to create a particular world of sound that weaves this multi-layered pie of a musical.